Keeping a healthy pet during the winter months can be very challenging. It’s cold out and who wants to run and play in the freezing temperatures. The two most dangerous conditions that you should pay close attention to and prevent are frostbite and hypothermia. Frostbite happens when your pet’s body temperature is so low that the body pulls blood from its extremities like the tail and paws which can form ice crystals in the tissue. Frostbite occurs and damages the tissue. This can be overlooked because it’s not noticeable right away. Signs to look for are pale or grey skin that is hard and cold. If it’s a severe condition the skin will turn black. Hypothermia occurs when dogs are in the cold for an extended period of time or if they get wet in cold weather. Signs of hypothermia are shivering, cold ears and paws, depression, weakness, and lethargy. If the condition is severe, their muscles will stiffen and heart rate and breathing will slow down. Make sure you know the signs of frostbite and hypothermia as these are life-threatening conditions. 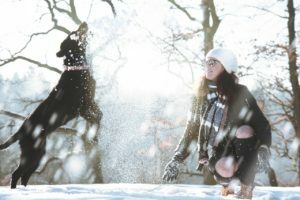 When winter weather hits exercise becomes less attractive to both you and your pet. However, it’s important to keep up with your pet’s exercise routine. There are many ways to stay active in winter other than outdoor activities although it doesn’t hurt to get outside for 30 to 40 minutes at a time. Below are some indoor activities you can incorporate into your winter walks and runs. Keep these tips in mind when winter months keeps you and your pet indoors and you’ll keep your pet healthy and safe. This entry was posted on Wednesday, October 24th, 2018 at 11:28 pm	and is filed under Dog, News & Updates. You can follow any responses to this entry through the RSS 2.0 feed. Both comments and pings are currently closed.